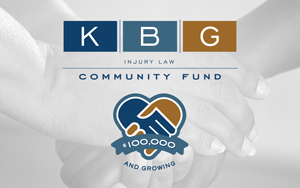 We are proud to announce that since its Community Fund inception in 2013, KBG Injury Law has now donated more than $100,000. The fund is set up through the York County Community Foundation. All of these donations have been largely possible thanks to the generosity of our own employees. Organizations that have received KBG’s donations have praised the firm’s fundraising efforts. We are honored to serve the very community that supports the firm, and intend to continue building up the Community Fund for more donation opportunities. To follow our latest sponsorships and donations, check out our Community Events page. Contact KBG at any time.